Slash and Burn ← You Want Me To Wear What? I am not a fan of leggings. I’m not. I belong to a Facebook group titled, “Leggings Are Not Pants, Cover Your Cooter,” started by Reader and Former Roommate Ava. However, in spite of that, I always try to look at each pair of leggings with a fresh eye, in the hopes that I will not find them distasteful. These leggings do not help that cause. 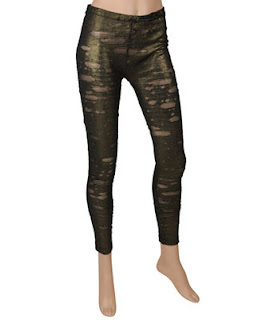 Let’s start off with the fact that they’re metallic leggings. That, in and of itself, doesn’t thrill me to my core. 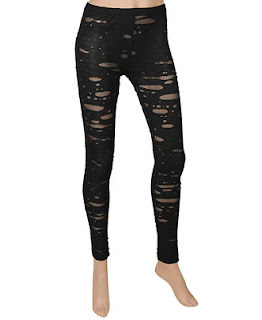 Add in the fact that the leggings are slashed – is that really necessary? And to have them ripped all over, even on the seat? Close up, the slashes look diseased, don’t they? Like they’re actually sores, rather than slashes. These are not pants. 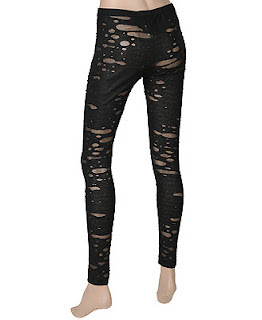 These are not even leggings. These are the rags you use to clean the oven. But they’re selling for $19 on Forever 21, which means that more expensive versions exist in the world. The very concept leaves me flummoxed. If you’d like to own a pair of these festering sore leggings, they come in not one, but three colors. Yes, three. Because really, the black is only appropriate for more formal occasions, isn’t it?